This week, I’m taking all my inspiration from food magazines. Of course, I can’t just follow a recipe without tweaking it somehow. That would make it far too easy! I saw this recipe in the first few pages of April’s Gourmet and instantly wanted to try it. I love a good, strong salad dressing. Olive oil, sherry vinegar, Dijon mustard, shallots, tarragon and capers combine for a tangy, salty vinaigrette that’s made for salads and soft-boiled eggs. Spicy arugula and crisp bread round it out for a meal-sized salad. I made this salad last night and again for lunch today. It’s just the right amount of fancy, healthy and delicious. I can’t get enough! Vinaigrette recipe adapted from Gourmet, April 2009. Begin by toasted the bread. Preheat the oven to 350 ° and spread the bread out on a baking sheet. Place in the oven for about 10 minutes, or until the bread is crisp and just beginning to toast. Remove and let cool. While the bread is toasting, make the eggs. Place 4 eggs in a saucepan and cover with water. Set over high heat. Once the liquid starts boiling, cook for 5 minutes. Remove the eggs with a slotted spoon and place in an ice bath, or run under cold water until they cool down. When the eggs and bread are done, make the dressing. Whisk the olive oil, vinegar, Dijon, salt and pepper together until evenly combined. Gently whisk in the shallots, tarragon and capers. 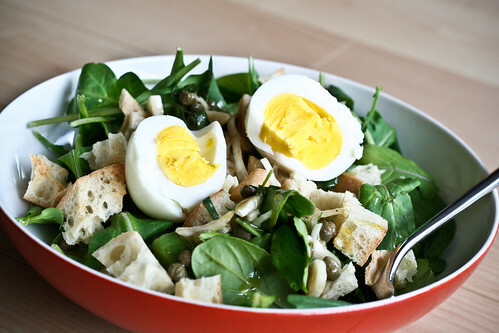 Toss the bread with the arugula and dress with the dressing. Serve with an egg on top. Makes 4 salads. If you want a more substantial salad, double the amount of eggs and serve with two instead of one.